The Rt Rev’d Philip North, Bishop of Burnley, decided to celebrate his 50th birthday with a splash in the Church Times, which has become a veritable flash in the Daily Mail, and justifiably so. 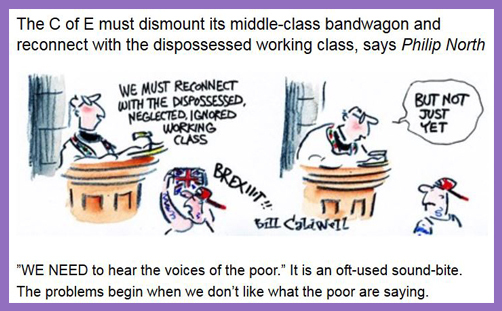 ‘Heeding the voices of the popular revolution‘ is a donnish headline: far better to go with the demotic jugular: ‘Bishop accuses “elitist” Church of England of being embarrassed by patriotism and failing to understand “frozen out” Brexit voters‘. Yes, that’s much better. Sometimes you just can’t beat calling a spade a shovel. And failing it is. Have you heard even one bishop stand up to defend Christian ex-magistrate Richard Page, who was not only sacked as a JP after 15 years of diligent and loyal service, but removed as a non-executive director on the board of Kent and Medway NHS and Social Care Partnership Trust, just for stating that it is preferable for children to be brought up by a mother and a father – you know, like in a family. Such beliefs and comments may apparently offend to the extent of summary dismissal, and it’s left to Christian Concern to do all the defending. Or have you heard even one bishop defend Daniel McArthur? What’s that? No? well, there’s a surprise. There is a marked reluctance to engage in such crucial matters of liberty: far easier to extol food-banks, bless solar panels or berate the government for the paucity of house-building. ..It is dangerous to read too many detailed conclusions from the EU referen­dum, but a constant refrain of the Leave campaign which re­­sonated with voters was the need to “take back control of our country”. It was less an anti-immigration vote than a patriotic vote from people who were fed up with having pride in their nation, its flag, and its armed forces misrepresented as intolerance or racism. There is no doubting the genuine grief and dismay of those who, in recent months, have found that democratic systems have delivered results with which they profoundly disagree, and the mere fact that they have lost the vote does not mean that they should change their minds. For example, listening hard to why someone voted for Brexit, and seeking to understand the complex range of factors behind his or her decision, does not mean that one auto­matically has to agree with Brexit. But, at the same time, it is vital that we stop condemning, and instead listen to the voices of those who have used their democratic right to express a deep-seated frust­ra­tion at structures and institu­tions that have abandoned them, and at a middle-class culture that misun­derstands or misrepresents their heart­felt concerns. Engage.. listen.. offer.. This is elemental ministry and basic missiology. It is indeed vital that clergy stop condemning with leitmotifs of ‘hate’, ‘racism’, ‘xenophobia’ and ‘nightmare scenarios’. They won’t, of course. Not least because they believe in the God who affirms their socialist or pro-EU politics, which is the path to moral responsibility and peace and reconciliation. It is ultimately “the theology of where they are coming from“… empirically unassailable and epistemologically irrefutable. Those who demur may phone the Bishop of Burnley, who will listen sympathetically and seek to understand. But don’t expect him to change. Snooper’s Charter: does Theresa May want to make windows into men’s souls?